It’s been back to the basics for me the past few weeks. I’m continually opting for easy and fuss-free outfits. I’ve basically been living in casual and cozy sweaters, relaxed jeans, ankle booties, a statement-making scarf, and just a few fabulous jewels. The bare necessities, if you will. Last year, one of my favorite wear-with-anything scarves was a beautiful pixelated number from Echo Design. (Worn here & here.) When I saw this new colorful design, I was sold. Normally, I don’t usually pick up silk scarves. But this one is silk on one side, while the other side is a solid blue modal fabric. It’s such a luxurious upgrade from a regular cotton scarf! Love that scarf! And it’s perfect for those of us with warmer weather who can’t wear wool very often! That’s a beautiful scarf and it really takes the outfit to the next level. Great choice. The nail color looks fab on you as well- so perfect for fall. I love the color combinations in this outfit. The scarf really adds that extra something. I need to incorporate more scarves into my outfits, they really make a difference! 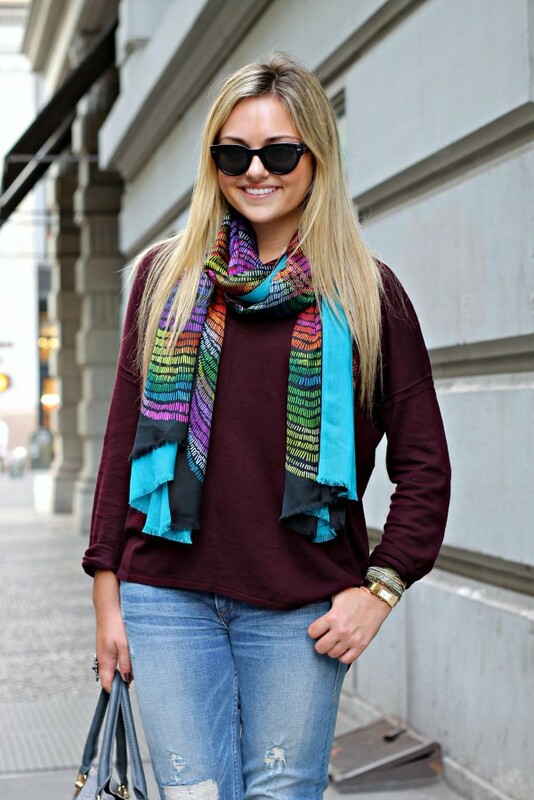 Gorgeous scarf!! It really highlights your face. Nice choice! Love this outfit! You should do a blog post on your new apartment! Cute casual look, love that bag. Great look, loving the boots. Love love love this look on you, Jessica! Gotta ask though – 2 scarves or 1? I say it’s 2. You’d be right at home at the Old Towne Fall Festival in your hometown! Love this cozy look, H&M have got a great selection of sweaters this year! I got a black Dolman for like 10 bucks at old navy and it’s now one of my go-to shirts! I can pair it with any scarf and pair of pants and it’s so comfy and soft! I love fall in Chicago! I love fall in Chicago, too! I’m actually going back there in a few weeks!